Since I have lost more than 100 pounds and have a new life, I am always on the lookout to meet others who have also succeeded at the weight-loss game. The journeys are often similar, and it is always interesting to share stories in hopes of gaining new ideas to support your own journey. At the end of this year I came across one such person who has such and inspiring story I wanted to share it. Steve Holm is an executive for Associate Foods. A year ago Steve failed his health assessment test at work. He was to report to a wellness coach. Steve decided to go to his doctor to prove the test wrong. His doctor told him he was in worse shape than the assessment led him to believe. "I finally asked my health coach for some help," Holm said. "'Please purchase a pedometer,' she said. I did (The Omron 'go Smart'), on which by the way, I have logged 5,500,000-plus steps." Steve received some advice from his pharmacist who suggested that he weigh each morning. This became his accountability piece, along with following the Weight Watcher point system. "I kept a food and exercise journal faithfully so I would have an accurate accounting of what I was eating and how I exercised," Holm said. "I exercise two full hours each and every morning, which consists of 6 miles on the treadmill walking." "Fiber is my new middle name as I'm 55 years in age and needed all the fiber I can get to keep my colon healthy and lose weight," he said. "Fiber is a huge key to feeling full and being healthy. Seasonings (not oil) saved my life because, let's face it, raw food and most vegetables need LOTS of spices to make them appealing to the mouth." "What more can be said about portion control than 90 pounds off the old body. … Long story short, when I took my first Personal Wellness Plan test (as required from my company) my age was determined to be 65.5 years old. I wept! Half-way through and with a great deal of personal strife, it was 56.5 years. Then almost like someone (I like to refer to him as Deity) made the light switch go on. … since then, for my last and final test, 48.5 years old. At 55-plus, that's a moral victory." Like Steve I have looked for every way I can to put fiber into my diet, both while losing weight and now keeping it off. One item that I thought was gone because of all the calories was pancakes. I have since put them back into my eating plan by just making a few changes that trims the calories and adds the fiber. Here is what I do: First, I use whole-wheat pancake mix. For each serving, it has 5 grams of fiber instead of the 1 gram found in white flour pancakes. 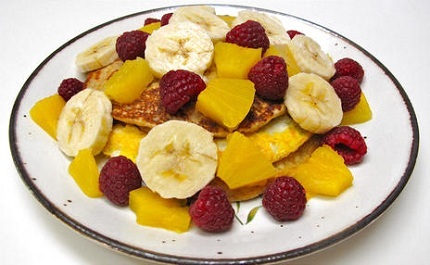 Instead of syrup (which can have up to 240 calories per 1/4 cup serving) I go for a serving of mixed fresh fruit. By simply adding an egg I have a very satisfying and healthful breakfast. You, too, can be like Steve and take this weight-loss journey and change your health and life forever. Remember small steps make a big difference to your health, weight, and happiness. Dian Thomas’s Idea Pack Library: You will never run out of ideas when you have this wonderful set of books. Check out Dian Thomas’ Creative Books Library Special: She now has a special offer to save 60% on 5 books and 1 DVD. Get Dian’s creative library for only $40.00. Save $60 dollar and have over 25 years of her creative and amazing ideas. This package will be great for gifts, for fun, and for kids and grandchildren. Take advantage of this limited offer at www.DianThomas.com.